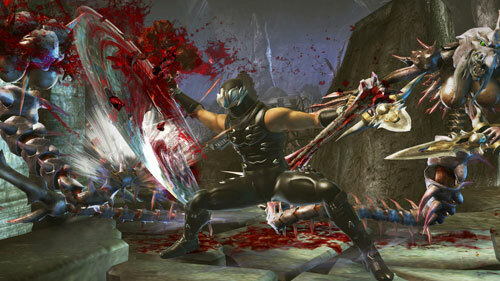 Just over a year ago, I finished Ninja Gaiden on the Xbox and wrote about how great it was, even a few years on. I loved the combat system and the challenge, and I still feel that the fact that it can still be well received as a PS3 game a couple of years after its original release shows how rock solid those foundations were. With Ninja Gaiden II gracing the 360 at the moment, though, and the graphical mantle having been surrendered to Devil May Cry 4 and, it’s safe to assume, the next God of War, the game is more reliant than even on the underlying mechanics to carry it. While it looks a lot better in motion than it does in screenshots, the first thing on Team Ninja’s shopping list should be an art director, lest it descend further into the id Software back-of-an-emo-kid’s-exercise-book, “what’s more awesome than a demon? A demon with a chainsaw and rocket launcher for arms!” school of monster design. A writer should be high up that list, too. The story here is laughable, rambling on and raising questions of exactly how many artefacts with the ability to bring about armageddon the Hayabusa clan is entrusted with (since they keep getting stolen, shouldn’t someone else take over?) to whether or not CIA agents really dress like this. The man behind this and the DOA series was sued for sexual harassment? Surely not! But does it play as well? Frankly, I’ve been disappointed so far. While certainly difficult and still mechanically strong, it’s much cheaper than the original (ignoring the zombie fish), frequently making fiends jump out from around the corner and immediately relieve you of anywhere up to half your life bar. And if you found the first game’s ninjas with exploding shurikens annoying, witness the frequency with which this game pits you against multiple archers with flaming arrows. While you have your own ranged weapons, between dodging shots you won’t have time to power them up and so must either waste whole quivers full of your own stock or charge them with jumps and wall-runs until you’re close enough to hit an attack, having to cope with being knocked back when one manages to tag you. Argh. The camera has attracted a lot of criticism and I honestly think it’s been overblown most of the time, given that it can be rotated with the right stick and centred with the right trigger. It’s no worse than it was in the first game in terms of functions, but the issues come from the fact that while the scale of things has been taken up a few notches, the camera hasn’t moved with it. It’s not a problem with you and a couple of ninjas on screen, but bump that number to a few fiends, the aforementioned off-screen archers, and even a mini-boss thrown in and you have yet more scope for frustration. Sounds like an exaggeration? There are a couple of scenarios where that’s exactly the sort of odds you’ll face in the first three chapters. Disappointing so far, then. The Xbox one walked a fine line where it wasn’t overwhelmed by difficulty and technical issues, actually ending up being reasonably balanced, and managed to be arguably the most graphically impressive game on the market at the time. If Ninja Gaiden II can’t boast a fair challenge or its status as a technical showpiece, what does it have? Previous PostFeature-Length Cut-Scenes?Next PostMetal Gear! ?